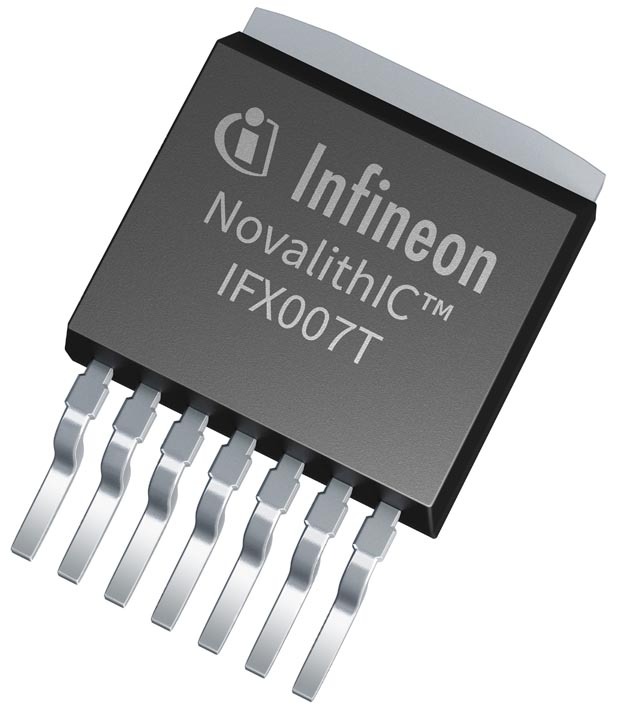 Infineon Technologies is launching the IFX007T NovalithIC™ motor driver for industrial applications. The IFX007T smart half-bridge provides an easy and efficient way to drive brushed and brushless motors, integrating a p-channel high-side MOSFET, an n-channel low-side MOSFET and a driver IC into one package. Along with a microcontroller and power supply, no other devices are necessary to drive a motor. For many years, Infineon has followed this unique NovalithIC integrated approach for automotive applications. The IFX007T now allows industrial customers to benefit from this experience. It is qualified according to JESD47I and can be used to drive motors with supplies up to 40 V and peak currents up to 55 A. The broad application range includes pumps, healthcare, home and garden appliances as well as industrial automation, fans, and many more. Ease-of-use is a key benefit of the integrated solution. It becomes apparent during the customer’s manufacturing process. Customers save layout and manufacturing effort while reducing stray inductances and external components. Additionally, only three general purpose microcontroller pins are needed to control a full H-bridge. The IFX007T has integrated self-protection, including over-temperature and cross-current protection. Within an H-bridge configuration, the half-bridge approach provides logic redundancy – if one device fails, the other can still stop the motor. Another key benefit is the flexible motor control. The IFX007T can be used in either half-bridge, H-bridge or three-phase configurations. Furthermore, the motor speed can be adjusted via pulse width modulation (PWM) up to 25 kHz. Active freewheeling is possible from either the high side or the low side. An adjustable slew rate enables reduction of electromagnetic emissions. The IFX007T is now available.